Unlike his contemporaries, who preferred bright, glowing colors, Alessandro Magnasco favored the dramatic contrast of lights and darks. Magnasco's small figures are executed with swift brushstrokes and darting flashes of light. 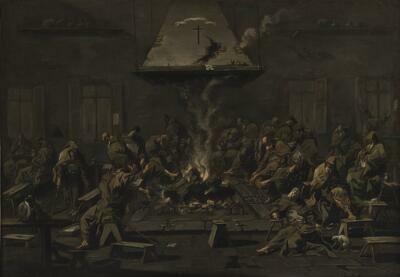 In this picture, the artist has painted a large group of monks or friars warming themselves around a fire. Magnasco's fragmented figures, made of quick strokes and a monochromatic palette, create an eerie scene that anticipates the work of Goya. Private Collection, Philadelphia, by 1922. Sir William van Horne, Montreal, Canada. The 18th-century Genoese painter Alessandro Magnasco was known for his depiction of intense emotion. He rejected the lightness and frivolity of the Rococo style that characterized so much of his age, and instead worked in an idiosyncratic manner, with forms fragmented by quick, darting brushstrokes. In his early years, Magnasco specialized as a figurista, adding small human figures into the landscapes of other painters. Around 1709 he moved to Milan, working for the local aristocracy and experimenting with new, evocative subjects. In Interior with Monks from about 1725, the figures appear eroded by shadow, and the swiftly applied brushstrokes reverberate with nervous tension. The color is restricted to browns, blacks, greys and whites, applied with great brio over a dark-red ground. Touches of white radiate from the gloom in which the monks seem conjured up like specters by an overactive imagination. They seem to be warming themselves by an open fire. But what is the actual subject here? In Milan, Magnasco actively participated in the learned debates of elite intellectual circles. As new Enlightenment ideas arrived from Northern Europe, favorite topics included opposition to corruption in the monastic orders, religious intolerance and social prejudice. This scene may reflect the artist’s spiritual and political sympathies, as well as his penchant for the spectacular and macabre. His highly charged painting style has often been compared to that of the 16th-century master El Greco, while his fascination with the darker side of life anticipates the realism of Goya in the early 19th century.